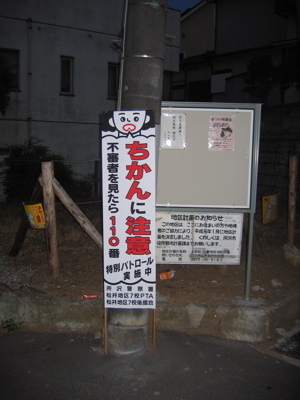 Basically, the sign says, “Warning: Perv*rt in the area: please call 110 if you see one”. Haven’t seen those signs posted along Main Street, U.S.A…. Sue, In Osaka city there are signs everywhere saying, “chikan akan”. That’s Osaka-ben for (loosely translated) don’t be a pervert or no perverts allowed.